The Feast of St James is celebrated in the Basque Country and Galicia by a public holiday on 25 July so it seems appropriate to post this piece now. 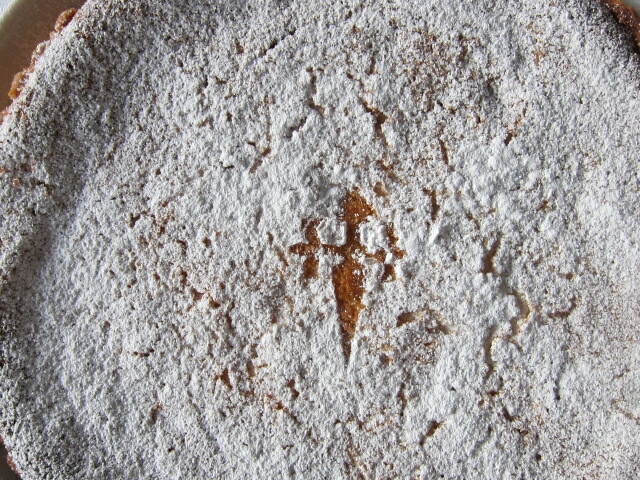 Not that the Spanish need such an excuse to bake Tarta de Santiago. You can find it throughout Northern Spain at any time of year. It is mostly associated with Santiago de Compostela in Galicia where the town's cathedral is reputed to hold the relics of the apostle St James the Great. A network of pilgrim routes originating in Western European countries lead to this place of Christian pilgrimage in the north-west corner of Spain. The trails are marked by the symbolic scallop shell for St James the Great, the fisherman apostle. The tarta, or torta in Galician, has been offered to pilgrims as a journeys-end food for hundreds of years. Tarta de Santiago is a fragrant almond tart or cake. Sometimes it's baked with a pastry base, other times without. Having a long history, naturally its origins are disputed. The splendid writer Claudia Roden believes it has its roots in a Jewish Passover cake and arrived in Galicia with jews fleeing Moorish rule in Andalusia. For the pastry, mix icing sugar and flour. Rub in the butter until the mix resembles breadcrumbs. Stir in the egg yolk until the mixture comes together (add a few drops of milk if the mix doesn't come together). Use your hands briefly to form it into a ball then wrap in clingfilm and refrigerate for a couple of hours. Preheat the oven to 180C (160C fan). 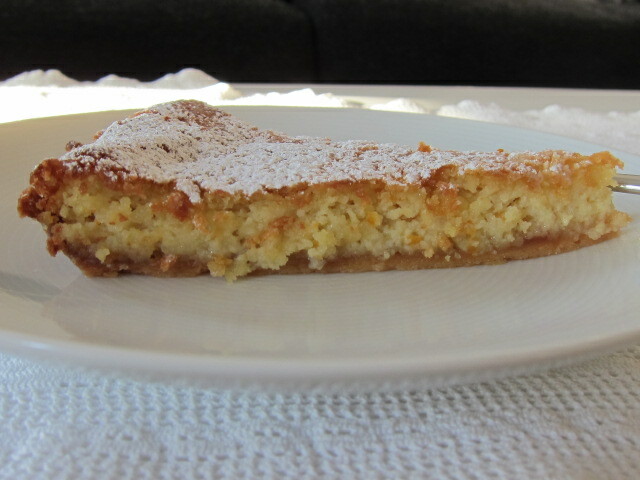 Lightly butter the 23cm shallow tart tin and dust with flour. Lightly flour a worksurface and roll the pastry thinly into a round a little larger than the tin. Place in the tin with the edges overlapping (don't worry if the pastry breaks up, just patch it in but do keep it thin). Line with greaseproof paper, weight down with baking beans and bake for 15 minutes. Remove the paper and beans and return to the oven for a few more minutes if the base is not cooked. Trim off the excess pastry to neat edges and turn the oven down to 140C (130C fan). Melt the membrillo with 1 tablespoon of water in a bowl over a pan of simmering water. Spread it over the tart base. Pulse the almonds, zest, juices and Amaretto (if using) in a food processor until mixed but fairly chunky. Mix the soft butter and icing sugar until creamy. Add the almonds and mix in well. Mix in the egg yolks then the whole egg. Spoon the mixture into the pastry case and bake for about 35 minutes. Allow to cool before turning out. *Dust with icing sugar and serve. * A template for the cross of St James can be downloaded from the internet if you would like to have this symbol on your tart. 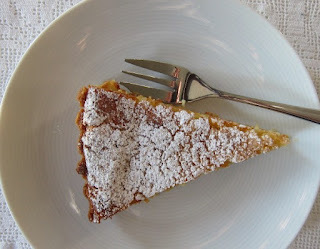 Cut out, place in the centre of the tart, dust with icing sugar and carefully remove the template.